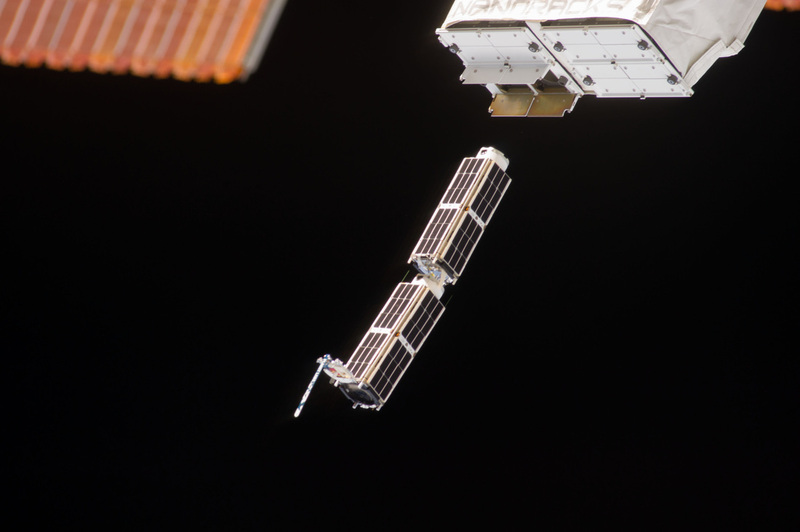 Planet Labs employs a large number of small satellites – known as CubeSats – in Low Earth Orbit, making use of different orbital positions to capture global imagery at a high revisit rate offered on the commercial market for a variety of applications in environmental monitoring, resource management, urban planning and many more. Operating the satellites in low orbits means they only have relatively short lifetimes on the order of months or a few years, requiring replacements to be sent into orbit at a steady pace. 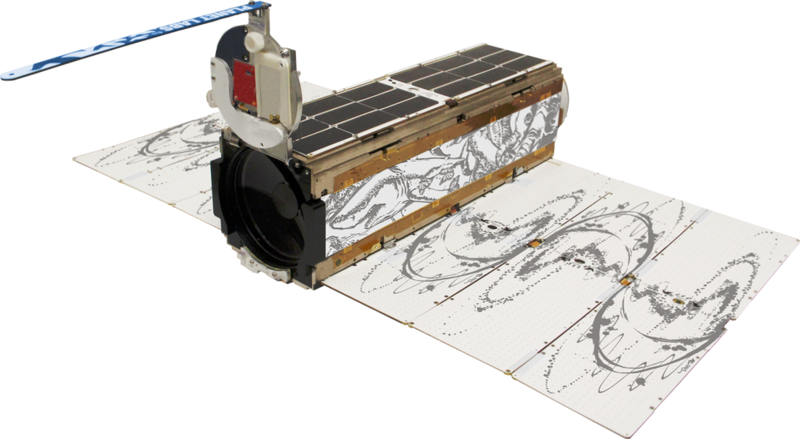 To date, Planet Labs deployed over 130 satellites using different launch vehicles and the International Space Station as an orbital launch pad. The standard Flock satellites, also known as Doves, comply with the 3U CubeSat form factor, measuring 10 by 10 by 33 centimeters in size and weighing approximately 4.5 Kilograms. They feature 90-millimeter telescopes and are capable of panchromatic, full color and near-infrared imaging of ground targets. The Flock 2B-2 satellite was launched on August 19, 2015 aboard Japan’s HTV-5 cargo transport vehicle that linked up with the International Space Station to deliver supplies and equipment to the six crew members in orbit, including a number of CubeSats to be deployed from Station. Flock 2B-2 was sent on its way on October 6 at 1:15 UTC being ejected from a NanoRacks CubeSat Deployer held in place by the Japanese Robotic Arm. Ejected alongside the 2B-1 satellite, Flock 2B-2 started out in an orbit of 398 by 406 Kilometers, expected to fly between nine and 15 months ahead of re-entry, depending on atmospheric activity that influences the drag experienced by the small satellites at this altitude. Flock 2B-1 re-entered the atmosphere back in the night (UTC) of September 21 – the 2B-2 satellite held out a little longer. Sunday’s re-entry event was reported between 18:42 and 18:45 UTC with observation reports being submitted from the Southampton, Portsmouth and Brighton areas, as far north as Reading and London. 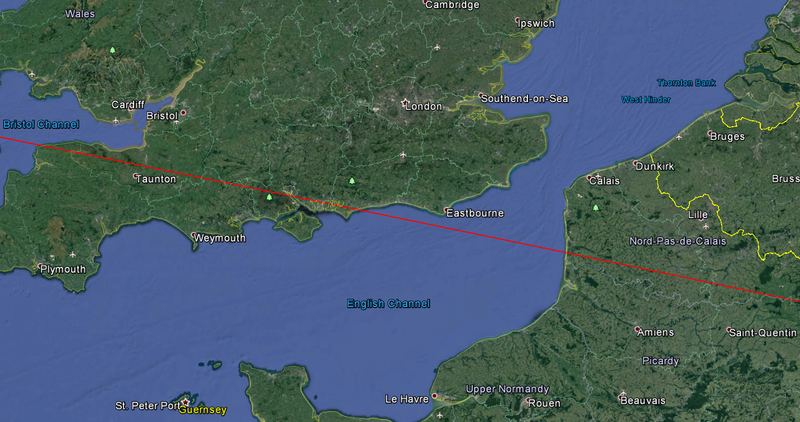 On the other side of the English Channel, sightings were reported near Caen, Le Havre and Barfleur. Over two dozen reports of the event were submitted to the International Meteor Organization most of which indicate at least two brighter pieces remained visible as the spacecraft broke apart and headed out over the English Channel. 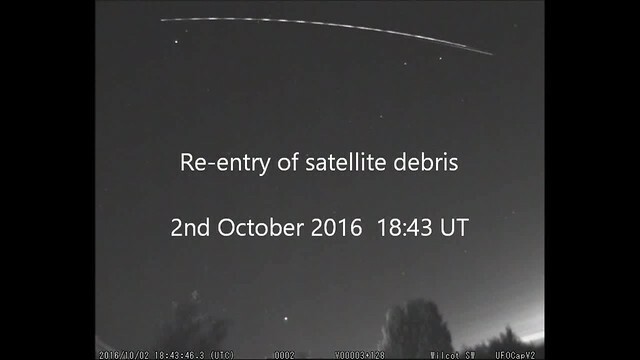 The UK Meteor Observation Network Station in Wiltshire caught a large portion of the re-entry on video. 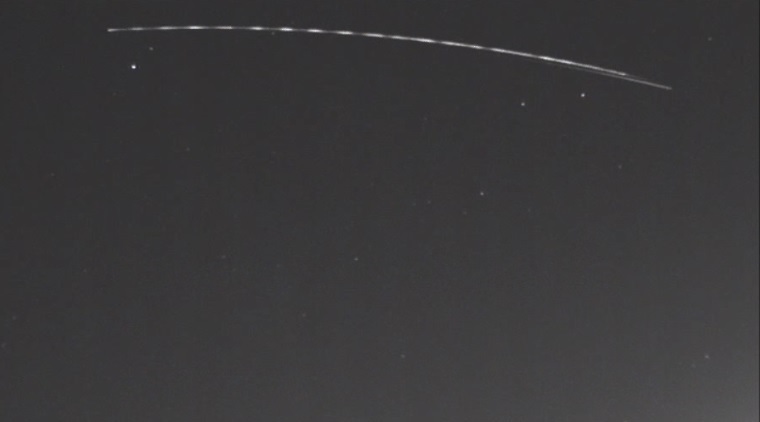 The video, shared on Flickr by Richard Fleet, shows a disintegrating object with the familiar debris and plasma trail behind each fragment of the spacecraft. 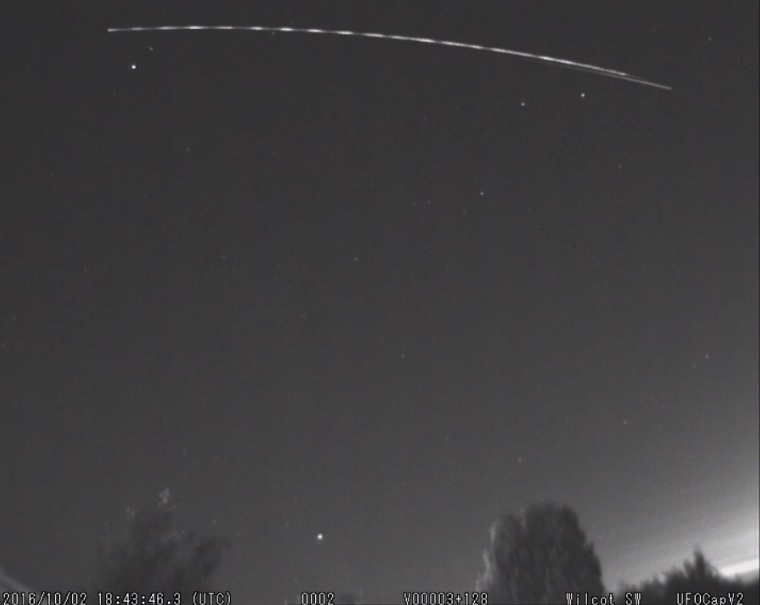 Three large objects can be discerned in the video including a very bright object that leads the debris train and shows a number of brightness variations that were likely the result of tumbling before breaking up itself. The satellite’s flight path at the time of orbital decay took it from north-west to south-east, heading over the South of England where it passed almost straight over Southampton and Portsmouth before heading out over the English Channel, flying towards Nord-Pad-de-Calais. At the time the video was taken, Flock 2B-2 was passing through 95 Kilometers in altitude and was only in the initial stages of the destructive portion of re-entry that typically occurs around 80 Kilometers when the principal spacecraft components break up due to the mechanical stress and extreme temperatures created by hitting the dense atmosphere at a speed of 7.8 Kilometers per second. This would indicate that the bright, tumbling object was the main satellite body or telescope section immersed in plasma while the trailing objects most likely represent the solar arrays and aperture cover which typically are the first components to be ripped off in the aerodynamic entry environment. CubeSats – due to their small size and typically light construction – are low-risk objects when it comes to the survivability of re-entry. To current knowledge, the Planet Labs satellites do not hold any dense components that could survive re-entry. All that was left by Flock 2B-2 was a cloud of dust in the upper atmosphere after putting on a show for observers on the ground.